A honeybee colony is reliant upon a single queen for the reproduction of its population. The queen is the only bee with fully developed ovaries. 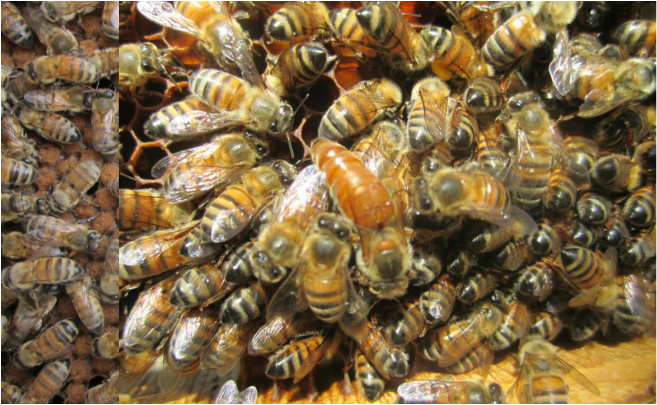 The queen mates only once with several male (drone) bees, and will remain fertile for life. She lays up to 1500 eggs per day. Fertilized eggs become female (worker bees) and unfertilized eggs become male (drone bees). The queens produce a sophisticated array of chemicals signals (pheromones) that influence both the behavior and physiology of their nest mates. Most striking are the effects of queen mandibular pheromones (QMP), a chemical blend that induces young workers to feed and groom the queen and primes bees to perform colony-related tasks.